What’s the impact of the T2 chip from Apple when it comes to data recovery of your Mac? By launching the Apple T2 security chip, Apple has attempted to increase the capabilities and security for its newest models of computers. 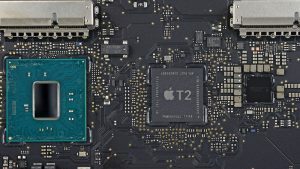 The iMac Pro and the 2018 MacBook Pro have been equipped with the T2 security chip. This chip is Apple’s second-generation chip for Mac which integrates several controllers, including the MSC – Management System Controller – , the audio controller, the SSD controller and the image signal processor already found in other Mac computers. It offers additional security features including hardware encryption for SSD storage. The new security features significantly improve protection against potential security threats such as protection against cold boot attacks, when attackers are able to gain physical access to a targeted computer, and which can be an issue with Macs which have FileVault turned on. Although extremely useful and secure, this encryption makes it impossible to carry out the data recovery of Apple computers in the same way it was done with older models and as such, is a significant change for independent data recovery centres and their clients. How to recover data on the new Apple 2018 MacBook Pro? It was first thought that with the removal by Apple of a port used to extract SSD data meant that the data could no longer be recoverable on the new models. Apple has now announced that, when clients’ logic boards are no longer functional or only partly working, computers fitted with a T2 chip will need a new data recovery process. The only condition for the data to be accessed is that there must be a way to power the system on. All what will be needed is a Thunderbolt 3 (USB-C) to USB-A or Thunderbolt (USB-C) to Thunderbolt 3 (USB-C), another host computer and an external hard drive where the data can be transferred onto. Once everything in place, the damaged machine can be switched to DFU (Device Firmware Update) mode, and Apple’s internal diagnostics tool will initiate the data recovery process. The external hard drive will be partition within 20 minutes and data will start being transferred straight away. The best and safest way to keep your data available at all times, even when an Apple MacBook Pro fails or is physically damaged or liquid damaged, is to perform regular back ups of the important data. If you think your Mac has issues and you are in desperate need of recovering your data, contact Data Doctor for a fast evaluation on 020 7394 2529.